Estate agents are busy people right now. Keeping valuation appointments coming in, organising viewings, sales progression, and generally keeping on top of 100+ emails every day and those niggling staff issues. And if all that were not enough, agents are also expected to be full-blown, expert marketers, as I highlighted in my recent blogpost. Now we are told that we must have a blog. But why? Is it really an effective way of capturing clients? Of generating new leads and more business? In short, is it the best way to spend a precious portion of our already over-committed time each week to write a blog post for our company? There are currently 152 million blogs on the internet, with a new blog being created by someone every half a second. Only half of these ever get to 6 blogposts – the rest simply get abandoned and forgotten, like that Amazon order still in your basket months later. It’s not enough to create a great blog, it has to be not just well-written and researched, but inspirational and thought-provoking too. It would be easy to start with high hopes and enthusiastic fingers, but what’s to prevent yours from being relegated to the dead blogs’ graveyard a few months down the line? On the one hand, we know that blogging can increase your website traffic, position you as an expert and build a valuable audience. But balance that out with the time you need to spend with new vendors, potential landlords, and actually adding something valuable to your business’ bottom line. 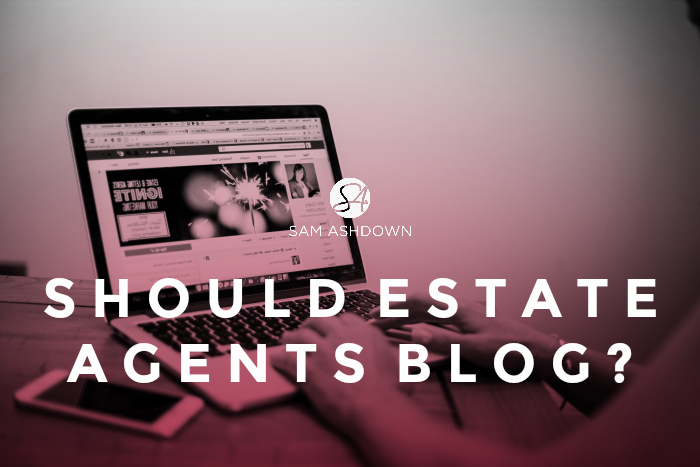 So what’s the answer to the question, ‘Should Estate Agents Blog?’ Funny you should ask, because I attempt to answer that question in my free webinar. If you’re reading this post before 2pm or 7pm on Wednesday 21st May, then you haven’t missed it. Just click this link to grab your free spot. And remember – your competition wants to know the answer too, so make sure you’re there! Previous post What’s Your Audience Worth? It’s a very nice post about estate agents. You have shared such a good post. Thanks! Thanks for your article and for your blog. We want create a estate agents blog for our website and i think is a good idea.